It looks as if one of the city’s most notoriously violent rooming houses goes under the microscope — or something like it — on Monday. In the last three years, I’ve been at 624-626 Balmoral St. more times than I can count on both hands. Not to buy crack, but to take in the latest (usually drug-fuelled) mayhem du jour there. A 27-year-old man is in critical condition after being shot at a notoriously violent rooming house in Winnipeg early Wednesday morning. You could wallpaper the entire place with the amount of police tape that’s been used there in the past little while. But, judging from the pictures above, the decor is not exactly top-of-mind for the owner or people who have lived there over the years. In the span of just a couple of months in 2008-09, two people were killed at the rooming house. I may have lost count of the other episodes of mayhem, but here’s the quick rundown of the homicides. If I’m not mistaken, there was another not too long ago. Just can’t quite remember it. On Nov. 8, 2008, Philip Mayur was stabbed to death on the second floor. The 39-year-old man had arrived in Canada from Africa in the late ’90s and made his way from Ontario to Winnipeg. Media reports said Mayur was the father of four children. On Dec. 4, police announced the arrest of two men in connection to Mayur’s death. The suspects, aged 26 and 42, were charged with first-degree murder, meaning police believe the killing was planned and premeditated. Their cases are still before the courts. Last January, Valerie Paypompee, 36, was fatally stabbed in a suite on the second floor of the building. Police allege her boyfriend killed her during a domestic dispute. Paypompee, who was from Shoal Lake, Ont., was Winnipeg’s second homicide of 2009. Mulugeta Geddy Gillamichael, 34, has been charged with second-degree murder in connection with her death. Gillamichael, originally from Ethiopia, was committed to stand trial in Court of Queen’s Bench in November, but no trial dates have been set. 1. Section 50(c) – Ensure that the stairways have a minimum head room of at least 195 cm, measured vertically from a line drawn through the outer edges of the nosing. 2. Section 52(1)(b) – Ensure habitable rooms in attics or partial storeys will have stairways leading to the dwelling must be at least 75 cm wide and must not be inclined to an angle of more than 50 degrees from horizontal and must be provided with a minimum clearance height of 180 cm measured vertically from a line drawn through the outer edges of the nosing. The owners are appealing [the work was to be done by Nov. 5] and will have to appear in front of Gord Steeves and the other members of the city’s protection and community services committee to voice their objection and ask for more time. 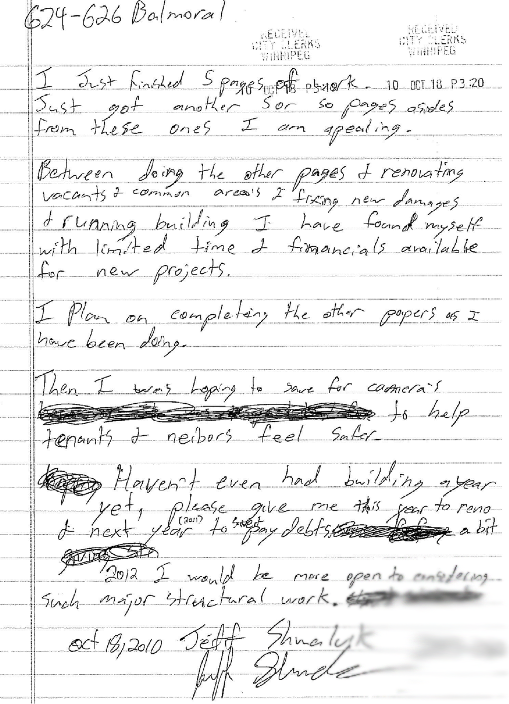 In a letter notifying the city of his appeal the owner says he’s owned the building less than a year and has been hamstrung by debt to pay for repairs. He does, however, say he’s hoping to save enough to install cameras that will somehow help residents and neighbours feel safer. Give him a year, he says, and he’ll be “more open to considering” doing such major structural work. At the end of the day, however, what would probably make everyone feel safer is if the poor souls inside were cleared out and the entire block was bulldozed. Here’s hoping that’s what Steeves et al. decide to do. We should be ashamed that people are even allowed to go within 10 feet of the entranceways given what’s gone on there over the years. Indeed, let’s hope it’s bulldozed. Interviewed a resident in the area who only lived a few blocks away this past summer. Apparently it’s known as “Murder Mansion” to neighbours. Yikes. I feel for the people who live there. Last time I was there, the group of them were camped out on the lawn of the park adjacent to it because a pool of blood was found in one of the bathrooms. Never heard a peep about it from the cops. I heard its way different now, cops hardly go at all compaired to before. 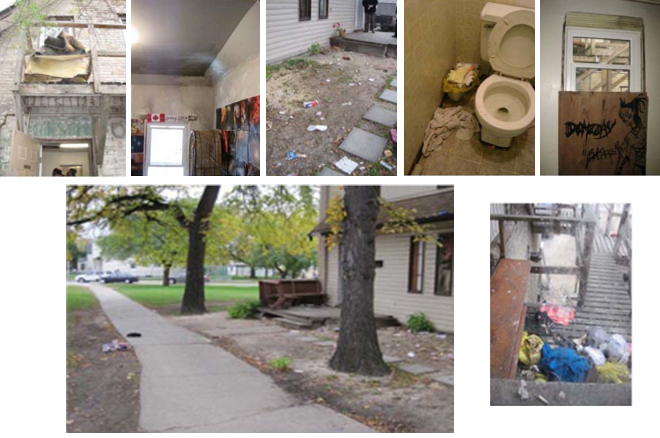 They kicked out the crack dealers & did a lot of reno’s on it to get better tenants. Although both these post are from almost a year ago & i believe these owners just got it a little over a year ago so you probably didn’t notice improvements as much yet back then. I’ve been to the apartment my friend stays there. I’ve heard there’s bugs and bed bugs now. The place has been sprayed only once but not enough. Tenants are still awaiting for windows to be put in and the whole thing about cameras surrounding the building isn’t convinent because the windows are still being smashed and idiots are let in. I don’t know how anyone can live in such condition. 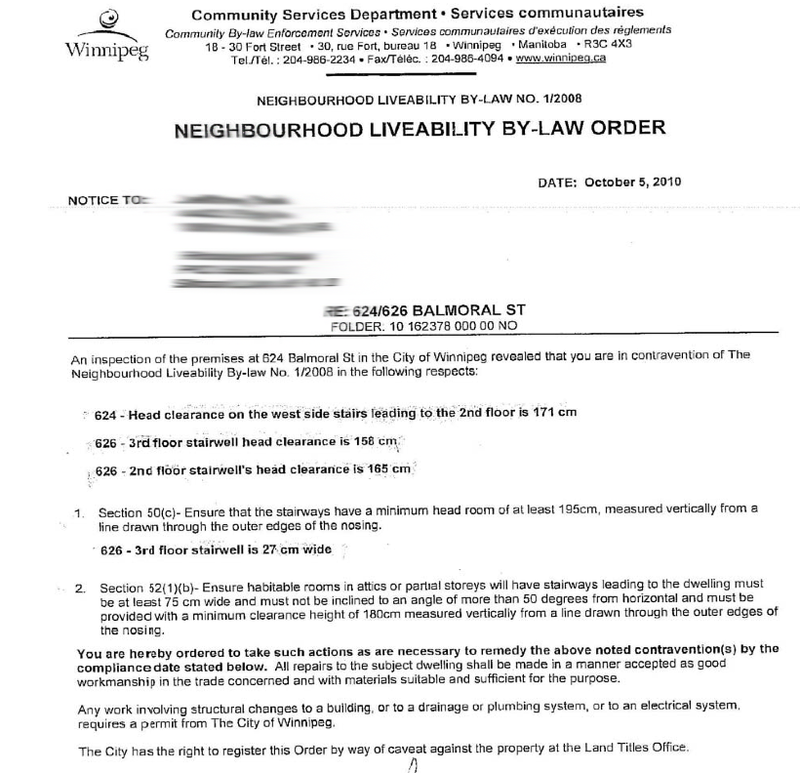 I read over the landlords letter to the police and to me looks like no big renos have been done in 2012! I lived in this sh*t hole. Me and my boyfriend at the time had no place else to go and he chose the murder mansion out of all places! As we were moving in, some girl started yelling at us and was being very threatening so we ran up to our room and locked the door. We went to bed and got woken up around 9:00am in the morning by a knock at the door. I looked out the peep hole and it was the police. They were escorting everyone out of the building because someone was stabbed. Everyone was outside until about 8:00 at night. Did you know that the police don’t clean up the blood that’s everywhere? I had to witness a dead persons blood all over the floor, the bathtub, the sink, all down the stairs. The guy was arrested because they caught him with shorts that had blood all over them, and the body was found over on Kennedy in a dumpster. And Kennedy is only a few blocks away. This place shouldn’t even have the chance to get fixed up! Just because it gets fixed up doesn’t mean that all those drug addicts and murderers are gunna leave!